Walter Olson has been writing a lot about Wal-Mart and FCPA. I don't have a lot to add except my own experience working for a large corporation in third world countries. I worked for a manufacturer of industrial equipment for years. In most countries in Europe and North America, part of our strategy was a dedicated in-house sales force that could provide a high level of technical support. But we went away from that strategy when we went into third world countries, just the place where we needed more rather than less technical support for our customers. Why? A big reason was the FCPA. There are many countries where it is simply impossible to do business without paying bribes. Bribes are absolutely wired into the regulatory process. In Nigeria, public officials are paid less with the expectation they will make it up on bribes, similar to the way we pay waiters who get tips. The only way to legally work in these countries is to work through third party resellers and distributors and other such partners, and then tightly close your eyes to how they get things done. What always ticks me off about these cases is the fake attitude of naivite in the press that seems to be constantly amazed that corporations might have to pay bribes to do basic things we take for granted here, like get the water turned on or have your goods put on a ship. But in fact reporters can't be this naive, as they almost certainly have to deal with many of the same things in their business. I would love to see an accounting of the grease payments the NY Times pays in a year in foreign countries. I think most people when they hear these foreign bribery cases assume corporations were paying to get a special advantage or to escape some sort of fundamental regulation. And this is possibly the case with Wal-Mart, but more likely they were simply paying because that is what you have to do just to function at all. Scathing report on how NY police gamed the process to improve their reported crime numbers. Nothing in this should be the least surprising to anyone who watched a few seasons of The Wire. These are not just accounting shenanigans. There were actions the directly affected the public and individual liberty. People were rounded up on the street on BS charges to pad arrest stats while real, substantial crimes went ignored in a bid to keep them out of the reported stats. For more than two years, Adrian Schoolcraftsecretly recorded every roll call at the 81st Precinct in Brooklyn and captured his superiors urging police officers to do two things in order to manipulate the "stats" that the department is under pressure to produce: Officers were told to arrest people who were doing little more than standing on the street, but they were also encouraged to disregard actual victims of serious crimes who wanted to file reports. Arresting bystanders made it look like the department was efficient, while artificially reducing the amount of serious crime made the commander look good. In October 2009, Schoolcraft met with NYPD investigators for three hours and detailed more than a dozen cases of crime reports being manipulated in the district. Three weeks after that meeting—which was supposed to have been kept secret from Schoolcraft's superiors—his precinct commander and a deputy chief ordered Schoolcraft to be dragged from his apartment and forced into the Jamaica Hospital psychiatric ward for six days. Folks on the Left prefer public institutions over private ones because they percieve them as more "fair." But the power of lawmaking and police and prisons allows public institutions to be far more abusive than private entities could ever be. We spent months and years torturing ourselves about accounting abuses at Enron, but these are trivial compared the accounting shenanigans state institutions engage in every day. “In the event of default (i) any non-official bond holder is junior to all official creditors and (ii) the issuer reserves the right to change law as needed to negate any rights of the nonofficial bond holder. “We should not underestimate the damage these steps have inflicted on Europe’s €8.4 trillion sovereign bond markets. For example, the Italian government has issued bonds with a face value of over €1.6 trillion. The groups holding these bonds are banks, pension funds, insurance companies, and Italian households. These investors bought them as safe, low-return instruments that could be used to hedge liabilities and provide for future income needs. It was once hard to imagine these could ever be restructured or default. “Now, however, it is clear they are not safe. They have default risk, and their ultimate value is subject to the political constraint and subjective decisions by a collective of individuals in the Italian government and society, the ECB, the European Union, and the International Monetary Fund (IMF). An investor buying an Italian bond today needs to forecast an immediate, complex process that has been evolving in unpredictable ways. Investors naturally want a high return in order to bear these risks. This is not to say that bondholders in private entities don't get crammed down in a refinancing or bankruptcy. But here we are talking about differential treatment of holders of the exact same class, even issue, of securities. These Are The Folks Who Are Wrapping Themselves in the Mantle of "Science"
Oops. Accounting error seriously overestimates benefits of biofuels. The European Environment Agency Scientific Committee writes that the role of energy from crops like biofuels in curbing warming gases should be measured by how much additional carbon dioxide such crops absorb beyond what would have been absorbed anyway by existing fields, forests and grasslands. Instead, the European Union has been “double counting” some of the savings, according to the draft opinion, which was prepared by the committee in May and viewed this week by The International Herald Tribune and The New York Times. The committee said that the error had crept into European Union regulations because of a “misapplication of the original guidance” under the United Nations Framework Convention on Climate Change. “The potential consequences of this bioenergy accounting error are immense since it assumes that all burning of biomass does not add carbon to the air,” the committee wrote. Duh. This has been a known fact to about everyone else, as most independent studies not done by a corn-state university have found ethanol to have, at best, zero utility in reducing atmospheric CO2. It is worth noting that the EU would likely have never made this admission had it solely been under the pressure of skeptics, for whom this is just one of a long list of fairly obvious errors in climate-related science. But several years ago, environmental groups jumped on the skeptic bandwagon opposing ethanol, both for its lack of efficacy in reducing emissions as well as the impact of increasing ethanol product on land use and food prices. WTF? 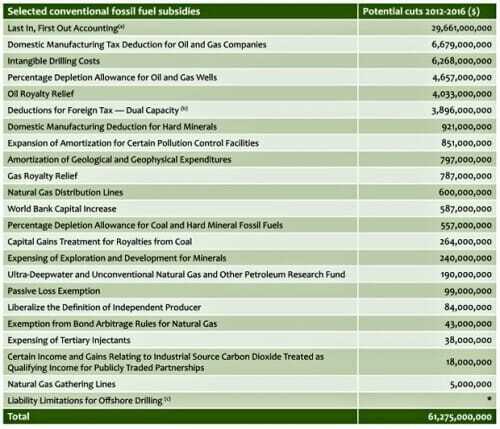 This is What They Mean by Oil and Gas Subsidies? Seriously, nearly half the "subsidy" number is the ability of a company to use LIFO accounting on inventory for their taxes? Since the proposition is to eliminate these only for oil and gas, what is the logic that somehow LIFO accounting is wrong in Oil and Gas but OK in every other industry? In fact, at least the first two largest items are both accounting rules that apply to all manufacturing industry. So, rather than advocating for the elimination of special status for oil and gas, as I thought the argument was, they are in fact arguing that oil and gas going forward be treated in a unique and special way by the tax code, separate from every other manufacturing industry. In fact, many of these are merely changes to the amortization and depreciation rate for up-front investments. Typically, politicians of both parties have advocated for the current rules to encourage investment. Now I suppose we are fine-tuning the rules, so that we encourage investment in the tax code in everything but oil and gas. I will say this does seem to be consistent with Obama Administration jobs policy, which has been to try to stimulate businesses that are going nowhere and hold back the one business (oil and gas drilling) that is actually trying to grow. I am fine with stopping the use of the tax code to try to channel private investment in politician-preferred directions. But changing the decision rule from "using the tax code to encourage all manufacturing investment" to "using the tax code to encourage investment only in the industries we are personally sympathetic to" is just making the interventionism worse. This is really weak. Not to mention flawed. Unless I am missing something, a change from LIFO to FIFO or some other inventory valuation rules will create a one-time change in income (and thus taxes) when the change is made. LIFO only creates sustained reductions in taxable income, and thus taxes, if your raw materials prices are consistently rising (it actually increases taxes vs. FIFO if input prices are falling). Given that oil and gas prices are volatile, its hard to see how this does much except extract a one-time tax payment from oil companies at the changeover. By the way, I am pretty sure I would be all for ending government spending on "ultra-deepwater and unconventional natural gas and other petroleum research," though ironically this is exactly the kind of basic research the Left loves the government to perform. I have always understood the "trust funds" for these programs were a crock, that we had spent the money in these funds years ago. But the accounting fiction is important for a reason I did not know - when the trust fund is used up from an accounting standpoint (vs. a cash standpoint, where it is not only already used up but never existed) in 2036 or whenever, statutory authority for spending is capped at annual tax collections, which at that point will be way, way below programmed spending levels. Medicare alone is projected to grow to 6% of GDP. wow. The reality of Obamacare's promises of cost reductions is starting to appear, as already these supposed cost reductions are being discounted by folks who have accountability for getting the numbers right. One thing to note -- Social Security actually has some shot at being repaired, because benefits are a fixed, predictable amount (as long as your actuarial tables are right). Medicare and Medicaid are far harder, because the benefits are open ended, and every recent "fix" has tended to shift incentives to encourage rather than discourage more spending. Note, for an example, the political pressure to eliminate the part D donut hole that actually is there to provide incentives to camp drug spending and prices. There was a fair amount of blog reporting on GM's IPO papers, focusing on various outsized risks reported in those documents. But for someone who has read a fair number of red herrings in the past, I can tell you these over-the-top risk statements are virtually pro forma. The lawyers don't want any suits down the road about failure to disclose, so every risk up to and including getting kidnapped by evil trolls if you buy the offering are listed. Via the Accounting Onion, I found an issues I have not seen well-reported. Tom Selling argues that without some accounting shennanigans at its reorganization, GM's equity should be negative. Reading between the lines, it does not appear that he is very confident that the SEC, which is a branch of GM's ownership group, will do much about it. The Senate will take a vote today to repeal the hugely onerous 1099 provision from the Obamacare legislation. Good news, though Obama is opposed to the repeal as he feels (probably correctly) that it will open the floodgates to further repeals and amendments. Which is pretty disingenuous, as one of the soothing memes he handed out when the legislation was being rushed through Congress was that there was plenty of time to amend and fix its rough edges. How he needs to decide if he was lying about that, as Congress addresses a rough edge that had nothing to do with health care but created a huge and largely useless burden on businesses. I know that this provision would really kneecap my business. Meanwhile, small businesses are staring in horror toward 2013, when the 1099 mandate will hit more than 30 million of them. Currently businesses only have to tell the IRS the value of services they purchase from vendors and the like. Under the new rules, they'll have to report the value of goods and merchandise they purchase as well, adding vast accounting and paperwork costs. Think about a midsized trucking company. The back office would have to collect hundreds of thousands of receipts from every gas station where its drivers filled up and figure out where it spent more than $600 that year. Then it would also need to match those payments to the stations' corporate parents. Most Democrats now claim they were blindsided and didn't understand the implications of the 1099 provision"”which is typical of the slapdash, destructive way the bill was written and passed. As the critics claimed, most Members had no idea what they were voting on. Yesterday the White House endorsed a competing proposal from Florida Democrat Bill Nelson that would increase the 1099 threshold to $5,000 and exempt businesses with fewer than 25 workers. Yet this is little more than a rearguard action in favor of the status quo; the Nelson amendment leaves the basic architecture unchanged while making the problem more complex. Businesses would still have to track all purchases, not knowing in advance which contractors will exceed $5,000 at the end of the year. It also creates a marginal barrier to job creation"”for a smaller firm, hiring a 26th employee would be extremely costly. 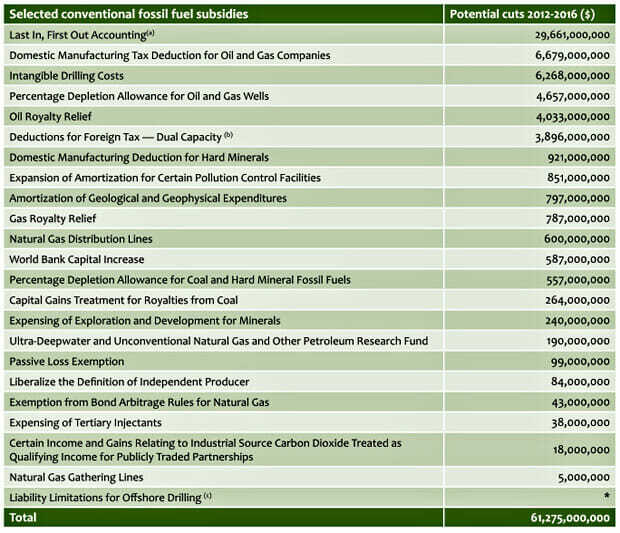 The Nelson amendment also includes new taxes on domestic oil production, as every Democratic bill now seems to do. This analysis is dead on -- our company generally cannot predict exactly how much we will purchase from a specific vendor in a year, so we would still have to collect tax ID's from every single vendor, not knowing which would cross the hurdle. One of the arguments Democrats have made for nationalized health care is that government expenses will be much lower than private companies. This is on its face absurd, given most people's experience with government agencies, but is nominally supported by low expense ratios in Medicare. I won't go into this today, but this is more an artifact of the way government does accounting as well as operations decisions at Medicare which may be non-optimal (e.g. Medicare does much less claims verification and investigation than private companies, which is why we see huge fraud cases from time to time). Anyway, we get a fresh example of private vs. public expenses on a very comparable basis in California workers comp. The public State Fund acts as an insurer of last resort as well as a competitor to many private providers. The fact that it is an insurer of last resort will increase its loss ratios, but its expense ratios of management or "claims adjustment" expenses should be similar. But of course they are not. State Fund's unallocated loss adjustment expense ratio was a whopping 51.4% last year compared to 8.9% for private carriers, while State Funds allocated loss adjustment expenses were 9.8% compared to the industry's 13.8% respectively. This means the management expense ration of the state agency is 61.2% of premiums vs. 18.7% for private companies. This just makes laughable the pious requirement in Obamacare that insurance companies keep their expense ratios under 20% -- or else the more efficient government agency will take over. We are facing a huge 29.6% increase in workers comp rates in California, in part because the very high State Fund expense ratios are averaged into the calculation. Bruce McQuain, as always, has some good analysis. Pension plans for state government employees today report they are underfunded by $450 billion, according to a recent report from the Pew Charitable Trusts. But this vastly underestimates the true shortfall, because public pension accounting wrongly assumes that plans can earn high investment returns without risk. My research indicates that overall underfunding tops $3 trillion. In a recent AEI working paper I've shown that the typical state employee public pension plan has only a 16% chance of solvency. More public pensions have a zero probability of solvency than have a probability in excess of 50%. When public pension assets fall short, taxpayers are legally obligated to make up the difference. The market value of this contingent liability exceeds $3 trillion. Productive people in this country are about to get plastered with huge new taxes. Hang on. In 2003, my company was in some serious financial problems. Post 9/11 commercial insurance premiums had just risen substantially, so much so that my premiums went up more than my total annual profits. At the same time I found out that a number of operations I had just acquired were profitable only because they were not in compliance with labor law, and my crash program to bring them into compliance was going to put me deeply in the red for that year. I did a whole bunch of things to right the ship, but the two most important were 1) I eliminated a whole layer of management, slashing 5 vice-presidents and having all the front line managers report directly to me; and 2) I eliminated the smallest and worst performing business units. Now, contrast this to what governments do in the same situation. Their first response, of course, is to do something I could not do - compel more revenue for themselves by increasing taxes. Those of us who make our living by the free decision making of others don't have this dictatorial option. The second thing that governments do is cut their MOST important, MOST valuable operations. In Seattle, it was always fire and ambulance services that would be cut. Because the whole game was to find the cuts that would most upset the public to try to avoid the necessity of having to make cuts at all. Its an incredibly disingenuous process. Any staffer of a private company that made cost savings prioritization decisions like government officials would be fired in about 2 minutes. Having removed a mere 25 employees so far, and having just suffered its deadliest year ever, Metro officials now want to raid $10 million from the agency's preventive maintenance fund in order to cover operating expenses, including salaries and benefits. Metro managers would rather skimp on passenger safety and reliability than clear out the system's deadwood and force serious concessions by the transit union. Moreover, even as it asks riders to sacrifice, Metro is fattening itself up, hiring two new "senior planners," one to a newly created position. According to Metro's official job description, they will be "responsible for participation in the development of an annual business plan ... identifying opportunities for future growth and development" and "defining future strategies." The civil courts of Maricopa County (which includes Phoenix) are being overwhelmed by photo-radar cases from state photo-radar trucks on state highways. In the 2008 fiscal year, ending June 2008, the total annual filings in the justice courts amounted to 435,014, which included DUI, traffic, misdemeanor and civil cases, according to the county. Since November 2008, speed-camera cases have flooded the justice courts, averaging 42,326 cases a month, accounting for 50 percent of the filings. Administrators for the justice courts expect the total might reach 600,000 this fiscal year. Of course the solution proposed is not to get rid of the photo radar but to raise fees to cover the administration. But you could have guessed that without me telling your, couldn't you? This is a brief announcement of an online IFRS survey that I have prepared with Pat Walters of Fordham University. I invited Pat to collaborate with me because we have divergent views on the questions being asked. Thus, I hope that together we have achieved a modicum of balance in the survey's design--particularly in the phrasing of the questions and response choices offered. There are only 12 multiple-choice questions, and afterwards, I cordially invite you to express your own opinions regarding its design by posting a comment to this blog post. We are also trying to reach many more stakeholders than any other survey has reached to-date on the IFRS adoption/convergence question. To that end, we hope you will choose to email the link at the bottom of this post to anyone else whom you think might have an interest in taking it. That's why under my plan, individuals will be required to carry basic health insurance "“ just as most states require you to carry auto insurance. They argue that these private companies can't fairly compete with the government. And they'd be right if taxpayers were subsidizing this public insurance option. But they won't be. I have insisted that like any private insurance company, the public insurance option would have to be self-sufficient and rely on the premiums it collects. It would also keep pressure on private insurers to keep their policies affordable and treat their customers better, the same way public colleges and universities provide additional choice and competition to students without in any way inhibiting a vibrant system of private colleges and universities. See? The public option will not be subsidized and will work just like public universities which are highly subsidized. By the way, it is almost impossible for government NOT to subsidize such an entity, in part because of the way government accounting differs from private accounting. Government accounting is on a cash basis, so large up front investments show as a first year loss with no future expense implications. In operation, it means capital spending is pretty much free. And numerous charges that private firms take on, such as liability insurance, are not charged for on government books. I compete with the government a lot, and have investigated this dynamic in depth. Even why my costs are lower, the government, because of the way it accounts for things, often thinks its costs are much lower than mine and they under-price us. One of the reasons GM entered bankrupcy was that its slow and ponderous beauracracy couldn't handle the pace of the modern marketplace. But one thing even than beauracracy could do was produce dealer rebate checks in a timely manner. When many of your dealers are running on only a thin cash flow margin, even GM knew it was important to get rebate checks to dealers quickly. Some New Mexico auto dealers have backed out of the cash-for-clunkers program and more may do so as the federal government takes its time providing cash reimbursements. Dealerships put up the cash for the rebates after being told by the Obama administration they would be paid back within 10 days of the sale. Schienberg said the group's dealers have been repaid for only about 2 percent of the clunkers deals they've made so far. Here is my prediction: You will soon see someone inside the government blaming the dealers, saying it is all because they are not following the 300-page process correctly or not filling out the forms correctly. Absolute unwillingness to write a check. Some of you know that I am in the odd position of being a libertarian who does a lot of business with the government, a result of my effort to privatize the operation of public recreation. I am in the position of sometimes paying the government money (I typically don't get paid to operate a facility, I operate it for profit and pay the government a rent or concession fee) and sometime in the position of getting paid. The government always demands all of its money owed to it well in advance (think of withholding, where you pay the government your taxes months before the true April 15 deadline). The government only pays in arrears, and sometimes well in arrears. Last winter, my funding troubles (when my bank holding my line of credit went bust) were aggravated by the fact that the government took 15 months to pay us $175,000 they owed us, at the same time it demanded an additional $500,000 in advance rent payments on the next year. By the way, since every post related to the government this month must be related to health care in some way, what they government is doing on cash for clunkers is highly related to the difference in overhead costs between Medicare and private insurance companies. The cash for clunkers processing is taking a long time in part because the government is worried about fraud and wants to make sure every car it pays out on was really qualifying and destroyed properly. This takes time and manpower and overhead. But this is exactly what private medical insurance companies spend their overhead on -- making sure that claims are real and justified and are not padded. Medicare has lower overhead costs, in part because of government accounting hides some overhead, but in part because Medicare does not do any due diligence before it cuts a check. It gets a form, it sends out a check. It does little checking to see if the claim is real.